a favorite sweatshirt is like an old friend. always there for you, comforting when you're feeling glum, and full of stories, funny and sad. didn't we all have at least one in our closets growing up? 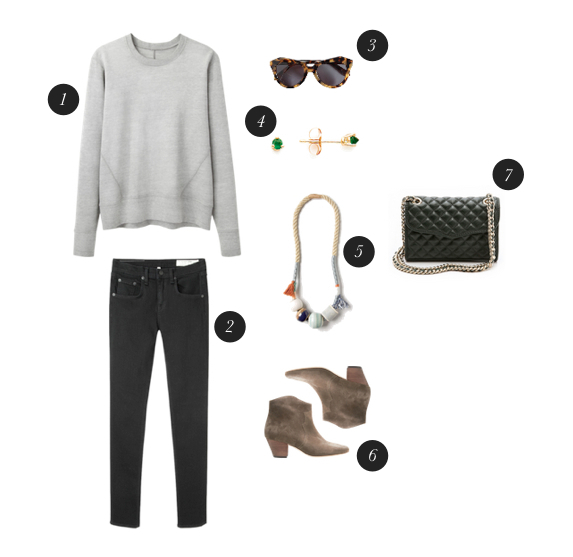 this fall, i'm in the mood for a chic reincarnation of the classic grey sweatshirt. it's one of those humble yet chameleon-like foundation pieces that somehow works with everything. what do you think about sweatshirts? did you/do you wear them? ooh yes yes and yes. I would like to live in that outfit. Yes I wear them but have not done so recently owing to the weather. I need it to cool down a bit and then I'll be itching to break out the sweatshirts again. And I hope to wear them in some kind of outfit like the one you have shown. I like them in theory, but not something I really "need." I have a long-standing bias about sweatshirts being "gym clothes," but I'm starting to re-think that. I substitute a soft beloved sweater instead, though I can totally see the utility and simplicity of the sweatshirt. Just bought a grey sweatshirt at J.Crew this past weekend, wore it to work today! Their current sweatshirt has more of a scooped neckline and slightly cropped arms, making it very flattering for borderline-petite me. Last year I bought a sweatshirt from Everlane and was disappointed in the quality. It pilled like crazy, becoming more scrubby looking than chic. Interesting, I've heard so many rave reviews of the everlane sweatshirts, it's good to hear the other side of the story as well. I've got two Everlane sweatshirts and I live in them. I haven't experienced pilling yet and the color remains after repeated washing! thought i'd jump in on this - i've got a few Everlane sweatshirts from their women's line and they've held up well. also have one from their men's line which has a nubbier texture i think due to the french terry material, but no pilling issues or color loss. maybe the one you had was from an earlier batch? i think they update their production details periodically but if you're concerned i'd email customer service directly - they're quite good about feedback and quality issues. Yep, mine was the first run. I'll give the sweatshirts another chance if they re-release for women, I've definitely been happy with everything else I have from them. I find myself keener on linen and cotton blouses at the moment, than tees. They add just the right amount of sophistication to a jeans and sandals outfit. I've been finding myself draw more and more to sweatshirts than more fitted sweaters. My default color is gray, of course, but I have them in other colors, too. They are part of my work uniform and I pair them with either pencil skirts or skinny cropped pants and pointy heels. H&M has had a very good selection recently, plain basics and some embellished ones. I'm currently eying one with cotton lace detailing on the neckline, trying to decide if I should get it in gray, white or both. I also have one from them in gray with beautiful, tribal-inspired, Marant-ish embroidery that I love. I wish the weather where I live was more conducive to sweatshirts. But as I live in a tropical country, I have to think twice about buying them, even if they are just from H&M or Zara. and I don't regret it one bit! In fact, I think I need another one, though a second grey one would be a little redundant. Still, it can't be beat, it feels luxurious on, but reads casual, but somehow not actually sloppy, but still totally effortless... basically everyday perfection in my book. That current elliott one looks great! Wearing one right now! But I'm having a hard time styling it with more fashion-y things, like jewelry for instance... I'm starting to think that it's because my sweatshirt is slightly too big and therefore looks too much like the regular gym-version. Maybe I need a version that's a little more fancy, with shorter arms and a slimmer fit and lighter fabric (although I remember how much I appreciated my current version last winter when it was freezing!). i have a couple in various fits - i think they're all versatile, from slim to slouchy. I have one in gray heather by J Crew, and I'm trying to "think outside the box" when I style it. I love it, and it's fun creating new, unexpected looks with it. It's a recurring desire of mine to buy one, but I never do because it's probably going to be too warm for me, but I might fancy it a stable if I lived in cooler climes. I like the way it looks layered over a white shirt. I think the best thing about it is that it seems like a pretty low maintenance option over a knit a sweater. exactly - though there are a lot of lighterweight options out now too. you might find one suited for SG! I'm not big into wearing sweatshirts except when I'm working out, but I love a great grey sweater, oversized or form fitting. But then, I really love the color grey. love the whole outfit in the top picture - the grey sweatshirt with the oxfords and the oxblood/wine colored/maroon nails. GH bass doesn't seem to do those shoes anymore and i don't know that the brand is that comfortable - any ideas on where to get a good pair of 2-tone oxfords like that? I'm also on look out for that grey sweatshirt, it appears easy but so elusive! I have a grey sweatshirt with hoodie that I wore to shreds literally that probably should be upgraded. I'm addicted to sweatshirts. The slouchier the better and preferably in grey too. I love that collage of yours because I'd wear everything on it. I love sweatshirts too. I already own 4 but every season APC or another brand does one that I'd love to add to my collection. I wear them mostly on week-ends really casually sometimes I had a shirt underneath for a preppy vibe. Great inspiring outfit you put together by the way. Did you see the Rebecca Minkoff bag in real? It looks very nice and since I can't afford that WOC or Trio just right now... It might be a good option. Definitely loving it as a cross between something more relaxed and menswear-like. My favourites have to be ones from Reigning Champ but they are unfortunately all sold out at the moment. love the collage you put together. i never liked grey until much recently when i started realising how versatile it can be on most skin tones. i'm on the hunt for a lightweight, preferably merino or cashmere jumper to wear with both pencil skirts and skinnies. this is on my 5-item challenge for now. kinda OT but i'd like to know how can one incorporate a capsule wardrobe or rotate a wardrobe if the local climate is pretty constant? well, it is sunny/humid most of the time in Singapore. it's the monsoon season now so it's rather rainy and stormy. cue in the sweatshirt and long-sleeved tops. without a 'next' season to look forward to, i have been having a bit of a problem coming up with a 5-item challenge list. most of the time it's based on a want basis, ie. i really really want awesomely made leopard pumps. if you or your readers have any thoughts, pls feel free to share! thanks! I've long ago relegated sweatshirts (chic ones) to gym wear. I prefer the sophistication of a luxe knit with a touch of the unexpected. I have a gorgeous grey cashmere sweater that's cute like a sweatshirt. i love how chic sweatshirts can be when paired with the right things. i've just bought a high-street version which i will soon pair with a black leather pencil skirt. how do you like that combination?